Laila eating chicken casserole & watching the cat, originally uploaded by Salim Virji. 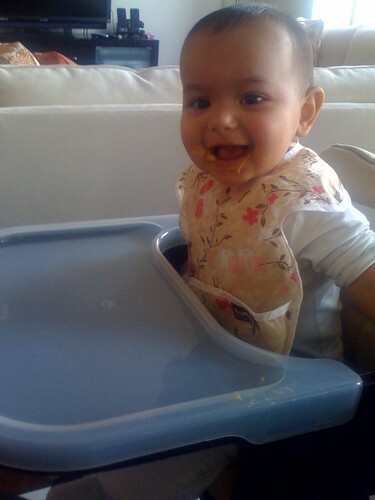 This was joy for everyone: Laila's first lunch, Laila's first meat (chicken! ), the cat was walking past, and the cat had some of the lunch that fell to the floor. Joy! This page contains a single entry by Salim M. Virji published on November 12, 2009 9:30 PM. Laila having a drink of water was the previous entry in this blog. Laila in her stripèd cap is the next entry in this blog.